Many books have been written about the Japanese attack on Pearl Harbor, but few give much attention to the role that Japanese submarines played in the attack. The title of Advance Force Pearl Harbor suggests this book will tell the history of the 25 Japanese submarines, including five with attached midget submarines, in the Advanced Expeditionary Force that participated in the attack on Pearl Harbor. The book does cover this subject quite thoroughly, although in a disjointed fashion, but the topics discussed in this history at times stray far afield from the title. Burl Burlingame, journalist with the Honolulu Star-Bulletin since 1979, has been interested in the Pearl Harbor attack since childhood, when he started to read everything he could find about the incident. This thoroughly researched book contains an extensive bibliography of primary sources and over 300 photos and diagrams. Although Advance Force Pearl Harbor has some drawbacks in organization and focus, the book contains the most thorough coverage on Japanese submarine involvement in the Pearl Harbor attack of any English-language book published to date. 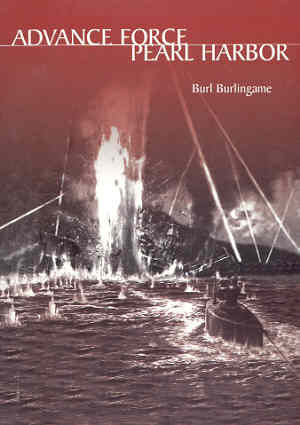 The author devotes many pages to the preparation, execution, and aftermath of the five midget submarines' operations during the Pearl Harbor attack. This topic extends from the first chapter to the last one, but much of the book's other material deals with battle action that occurred far away from Pearl Harbor or long after the attack on December 7, 1941. For example, one chapter near the end includes several pages about the March 1944 slaughter of civilian sailors aboard the Dutch freighter Tjisalak carried out by the I-8 submarine, which participated in the Advance Force for the Pearl Harbor attack. The scope of the book becomes less focused in the last half, which includes topics such as Japanese submarine attacks off the U.S. West Coast and against small, far-flung Pacific islands. The huge number of names, places, ships, and events makes this book difficult to read in places. In addition, the author often breaks up longer stories into several pieces and includes many pages of unrelated material in between these parts. This technique makes it even more difficult to follow a narrative involving many people and other details. For example, the story of the sinking of the freighter Lahaina by the Japanese I-9 submarine on December 11, 1941, and the survival of 30 men who reached Hawaii after ten days in a lifeboat gets divided into three major parts with dozens of pages in between (pages 146-7, 293-9, 336-7). Of strange and distant lands. Chapters 12 to 19 constitute the heart of the book with a description of battle action of Japanese submarines and American warships around Pearl Harbor. Sakamaki's midget had several mechanical problems, including a non-functioning gyrocompass, so he and his crewman Kiyoshi Inagaki could not control its direction. They eventually abandoned the midget after setting explosives to scuttle it, but they failed to explode. The small craft ran aground and was recovered so that Navy Intelligence could investigate this Japanese secret weapon and its contents. Inagaki died on the way from the midget submarine to the shore, but Sakamaki was captured after washing up on the beach. Nobody knows exactly what happened to the other four midget submarines after release from their mother ships since no crewmember survived. The book's narrative does not clearly describe the fate of each midget submarine, but Burlingame in 2002 wrote an article entitled "First to Die" in the Honolulu Star-Bulletin that summarizes the current status of historical research related to these four midget submarines. More than one hour before the aerial attack on Pearl Harbor at 6:45 a.m., the destroyer Ward (DD-139) fired the first shot of the Pacific War at the conning tower of one of the midget submarines. Ward dropped depth charges that sank the midget (according to 2002 article, most likely the one piloted by Ensign Akira Hiroo from the I-20 mother submarine). Within an hour after the first Japanese planes attacked Peal Harbor, the destroyer Monaghan (DD-354) rammed a midget submarine inside the harbor after the midget fired two torpedoes. Subsequent depth charges succeeded in sinking it (according to 2002 article, most likely the one piloted by Lieutenant Naoji Iwasa from the I-22 mother submarine). In 1960, another midget submarine (according to 2002 article, most likely the one piloted by Lieutenant Junior Grade Shigemi Furuno from the I-18 mother submarine) was recovered from Keehi Lagoon and is now on display outside the Etajima Museum of Naval History. The last midget submarine, piloted by Lieutenant Junior Grade Masaharu Yokoyama from the I-16 mother submarine, has not yet been discovered. However, Chapter 15 has a very interesting photo and an enlargement of a section of the photo that may show a midget submarine firing a torpedo during the aerial attack. Burlingame speculates in his 2002 article that this may have been the I-16 midget submarine. On December 8 after midnight, Yokoyama radioed the message of "successful surprise attack" to the I-16 mother submarine, but it is not known what happened to his midget submarine after radio communication ceased at 1:11 a.m. The nine crewmen to die in the five midget submarines that attacked Pearl Harbor were the first members of Japan's Special Attack Forces. The phrase "special attack" in Japanese indicates the suicidal nature of their mission, and much later in the war the Special Attack Forces included other suicidal weapons such as kamikaze planes, kaiten human torpedoes, and explosive motorboats. Admiral Yamamoto wanted provisions to be made for the rescue of the midget sub crews, and the mother submarines that carried the midgets were to wait at a rendezvous point seven miles west of Lanai. However, the designation of the five midget subs as a Special Attack Flotilla and the crewmen's writing of last letters to their families showed that they had almost no hope of survival. 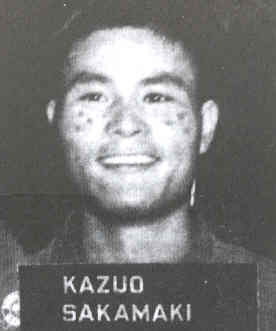 Kazuo Sakamaki felt that he had failed in his responsibilities. Upon his capture, he said that he wanted to commit suicide as the honorable act for a Japanese Naval officer, and he wrote on December 14, 1941, as part of a long letter, "Thus I betrayed the expectations of our 100,000,000 (people) and became a sad prisoner of war disloyal to my country." Before getting his POW photograph, he pressed a lit cigarette into his cheeks and branded six small circles on his skin making the shape of a triangle on each cheek. He stayed in various POW camps on the mainland U.S. until the end of WWII. After the end of the war, Sakamaki joined Toyota as a clerk and eventually became an executive and the head of Toyota's subsidiary in Brazil. The nine midget submarine crewmen who died were promoted two ranks and were honored as war gods. The Japanese propaganda machine could make public the previously unknown secret weapon since Sakamaki's midget had been captured. Many Japanese Naval leaders had been against deployment of the midget submarines, since they could have alerted Americans of an impending attack. Despite the glory bestowed by the Japanese press on the Special Attack Flotilla members for their heroics at Pearl Harbor, they had little or no battle success even though Japanese propagandists attributed battleship USS Arizona's sinking to a torpedo fired from one midget submarine. In the book's last chapter, Burlingame summarizes the reasons for the midgets' lack of success: "The midget submarines failed at Pearl Harbor due to a triple-punch. Their own inexperience and too-brief training period, Pearl Harbor's difficult waterways and the alert, dogged response of American destroyers mitigated against success."